Garrett Neese/Daily Mining Gazette Valorie Troesch of the League of Women Voters of the Copper Country talks to residents about the Open Meetings Act Tuesday. 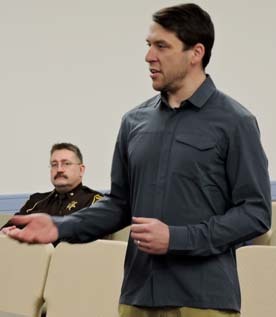 HOUGHTON — Residents got a crash course in the state’s Open Meeting Act at a League of Women Voters of the Copper Country forum Tuesday at the Portage Lake District Library. Michigan’s act sets minimum standards for transparency for public legislative or governing bodies. Rights of the public include being able to attend meetings, record or broadcast them and address the board. The board must make its decisions in public. In most cases, those deliberations must also be conducted in the open. For instance, the law prohibits members from texting or emailing each other during the meeting to communicate. 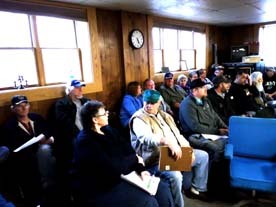 “When a public body is having a meeting, what the members have to say has to be publicly stated in front of everybody who is there,” said presenter Valorie Troesch. The law does not forbid members to participate electronically. If it happens, members of the public need to be able to hear what is being said. Though it’s not barred, remote participation is still subject to the rules of the particular government. In the case of the Houghton County Board, it allowed former Commissioner Scott Ala to participate in meetings via phone last year, but not to vote. Closed sessions are allowed for certain topics, such as personnel matters or collective bargaining negotiations, if one or more of the people involved request it. Bodies can meet with an attorney regarding strategy on pending litigation, but only if an open meeting would have a “detrimental financial effect” on the county. “That’s a pretty undefined or imprecise standard, but it does put some qualification that if a public body can’t somehow justify it, then even talking with the attorney would have to take place in an open meeting,” Troesch said. Meeting minutes must be made available to the public. Proposed minutes must be available eight business days after the meeting. The time shrinks to five business days for approved minutes. Notices of meetings must be posted in advance. Meeting schedules for the year have to be posted at the body’s administrative office within 10 days of the first meeting. Rescheduled regular meetings must be posted within 18 hours of the new time. If the body has a website, it must be posted on the main page or one set up for public notes for nonregular meetings. The public notice does not require bodies to post an agenda prior to the meeting. Troesch praised Houghton County Commissioner Gretchen Janssen for instigating the board’s new policy of also putting the members’ packet by the Friday before the meeting. In addition to the agenda, the packet contains copies of proposed resolutions and background information. Michigan’s Open Meetings Act law can be found at legislature.mi.gov. An Open Meetings Act handbook from the attorney general’s office is also available online at michigan.gov.